Belarusian coin Navasielle. A tradition in Belarus is to let the cat into the house first. It is considered proper etiquette to invite guests at least a few days, or up to three weeks, in advance. Gifts are customarily necessary. They usually consist of something for the new house (such as a potted plant, a vase, or a picture frame) or something to be enjoyed during the party (such as a bottle of whiskey, a bouquet of flowers, or a gift basket of foodstuffs). Bluebirds are often given in some countries as they are believed to bless the new house with happiness and good luck. Today it is also customary to provide bluebird-themed paraphernalia such as china. Pineapples and coconuts are also common housewarming gifts and the pineapple and coconuts have served as a symbol of hospitality and warm welcome through the history of the Americas. In East Lancashire as in parts of Scotland (particularly Ayrshire and Banffshire) a frog is seen as a giver of good luck. A gift of a frog is often made[dubious – discuss] as a wedding or housewarming gift for good luck and fertility. In Germany, it is common to bring bread and salt. This symbolizes community the wish for community and wealth. Another possible gift are certificates, for example from a furniture shop. Guests also usually bring something to drink or a homemade dish, such as a salad or a pie. The term "housewarming" is descended literally from the act of warming a new house, in the days before central heating. Each guest would bring firewood, and build fires in all the available fireplaces, offering firewood as a gift. Aside from warming the house, this was also believed to repel evil spirits by creating a protective atmosphere of warmth. Uninhabited houses were considered targets for vagrant spirits, and therefore used to require a certain level of cleansing before a house was safe to be occupied by young children. The origin is from the medieval times. A housewarming party is called a pendaison de crémaillère, literally "hanging of the chimney hook". The expression comes from medieval times. When the construction of the house was finished, it was customary to invite all those who participated in its building to eat dinner as a vote of thanks. The food was prepared in a large pot, the temperature of which was controlled by a chimney hook, which could adjust the pot so it sat higher or lower over the fireplace. This hook was the last thing to be installed in the new house, marking the beginning of the thank you meal. In India, this ceremony is known as "Gruha Pravesh" (गृह प्रवेश in Devanagari) or புதுமனை புகு விழா/Pudumanai Pugu vizha (Tamil) or "Gruha Pravesam" "గృహప్రవేశం" (Telugu) or "ಗೃಹ ಪ್ರವೇಶ" (Kannada) literally meaning "Entering New House" (for the first time). In some places, they allow a cow (sacred animal among the Hindus) to be the first to enter the house, as the first part of the ceremony. The ceremony usually involves VastuShant (वास्तुशांत in Devanagari). In New Zealand, the United Kingdom, and other Commonwealth countries, a housewarming party may also be known as a flatwarming party, usually in a shared living situation involving flatmates. The traditional Thai housewarming is a Buddhist ritual in which monks, family, friends, and food all play important roles. In the Southern United States, an old-fashioned type of party, known as a "Food Pounder", is popular. Traditionally, each guest would bring the new homeowners a pound of food such as cheese, cornmeal, flour, sugar, or any other staple food needed to stock the new home's pantry. In modern times the tradition has been extended to canned goods and even fresh foods, but the hosts are still most likely to receive the basic foodstuffs needed to set up a kitchen. 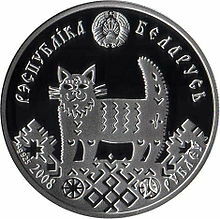 In Russia and former USSR countries, it is believed that it is a cat who should be let to enter the new house first, which will bring home and family luck. A housewarming party may be thrown upon completion of renovation or remodel. A housewarming party may be presented as an "open house" where people are free to come and go during a fixed window of time on a given day. A housewarming may involve a potluck meal. Some people invite all of their new neighbors to their housewarming. This allows the hosts to meet their new community. In some communities, neighbors may bring the housewarming party to the new residents to welcome them. ^ "Emily Post Institute—Invitation Etiquette". Emily Post. ^ An Etymological Dictionary of Modern English: In Two Volumes – Ernest Weekley – Google Books. Books.google.co.uk. Retrieved 2013-02-18. ^ "Thai Housewarming Ceremony – Monks, Family, Friends & Food » Temple of Thai Food". Templeofthai.com. Retrieved 2013-02-18.